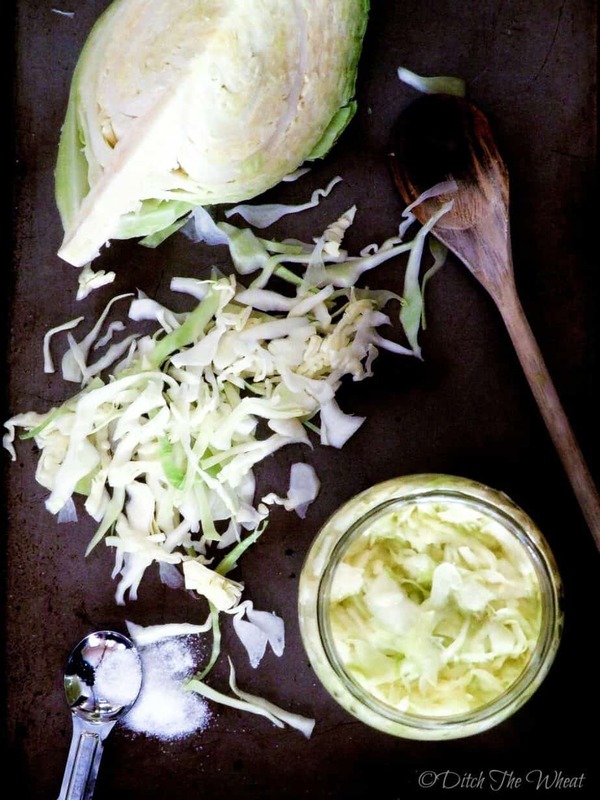 Continuing on with my obsession with cabbage which started because of Alex Lewin and his book, Real Food Fermentation. First I thought it was exciting to learn how to make raw sauerkraut. 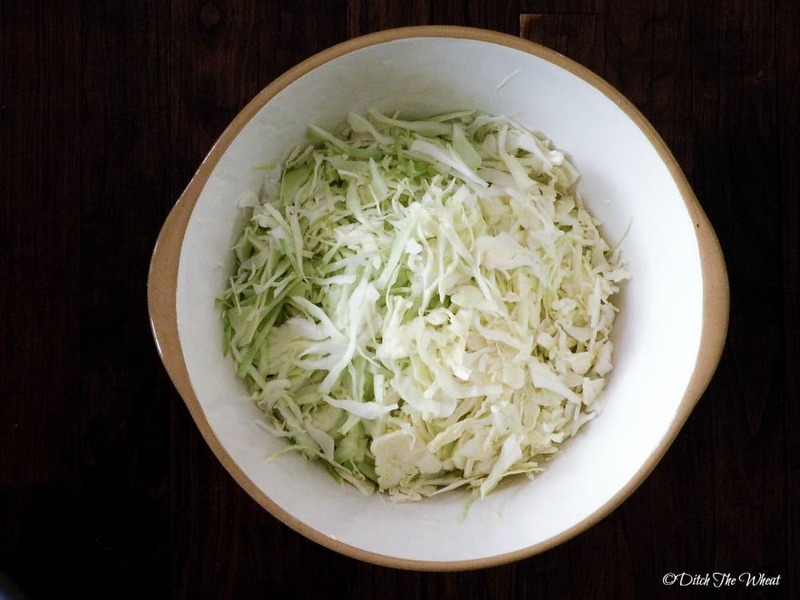 Then I couldn’t stop making the raw sauerkraut recipe… The process is easy as 1-2-3. I asked Alex for permission to share his raw sauerkraut recipe with everyone. I like this recipe and raw sauerkraut tutorial because I thought it would be so complicated that I would never attempt to make it. Then I made it and realized, “I made raw sauerkraut in like 10 minutes…” I’ll even make it between commercial breaks for a t.v. show. The hard part is waiting for it to ferment. 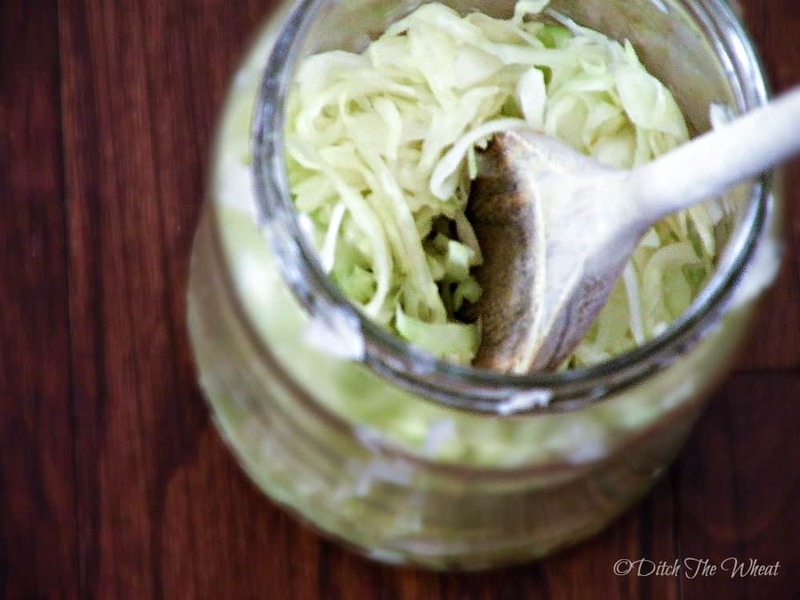 If you have Alex’s book, Real Food Fermentation, his Basic Sauerkraut recipe is on page 61. You need: 2 pounds of cabbage, (900 grams) – green or red cabbage works best 4 teaspoons sea salt, (20 grams) Equipment: Large cutting board Large knife VERY Large mixing bowl (emphasis on the VERY large. Shredded cabbage takes up a lot more room then you think) 1 quart mason jar (950 ml) with a tight fitting lid. I recommend a food scale. Take the outer leaves off of the cabbage. Cut into 4 wedges. Take your large bowl and place it on the food scale. Make sure your weight is represented in grams. Press tare to show only the weight of what is placed in the bowl. 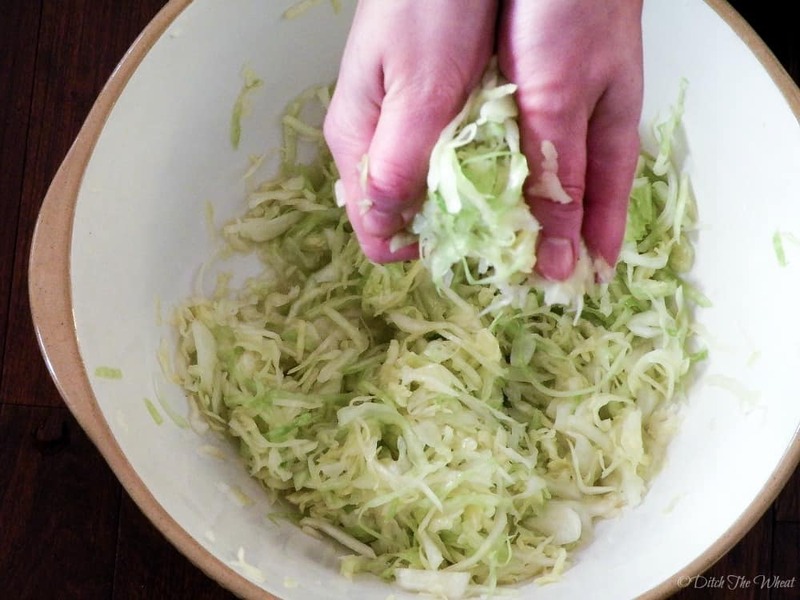 Using a knife/mandolin or food processor shred the cabbage. You can shred it thin or thick. I find it is easier to shred it thin because you can massage it better in the next step. As you are shredding the cabbage place it in the bowl to weigh. Stop when you reach a weight of 900 grams of cabbage. It is important to keep the ratio of salt to weight of cabbage because fermentation is a science. Measure out 4 teaspoons of sea salt and sprinkle it all over the cabbage. If your hands are dry you should wear gloves to do the next part. Massage the salt into the cabbage. You need to release water. Keep scrunching handfuls of cabbage. You are done massaging the salt into the cabbage when you can squeeze the cabbage and water comes out. Don’t stop at a trickle of water continue until water is pouring out when you squeeze it. Pack the mixture into your jar. Stopping once in a while to use a spoon to push it down. All of the cabbage can fit into the one jar. At the end pour the water remaining in the bowl into the jar. Push the cabbage down so there are no air pockets. The cabbage should be covered by water. Ensure there is at least 1 inch of space between the top of the cabbage and the mouth of the jar, because the cabbage will expand as it ferments. Close the lid of the jar and place it in a cool, dark place. Sometimes I place the fermenting jars in the basement and other times in a kitchen cupboard. Check on the sauerkraut every day. Open the lid, look for tiny bubbles, smell it, taste it. As it ferments the taste will change. Use a fork to push the sauerkraut back into the liquid. It takes it 4 days to ferment. Once the sauerkraut has fermented you can store it in your fridge. 1 quart mason jar (950 ml) with a tight fitting lid. I recommend a food scale. Take the outer leaves off of the cabbage. Cut into 4 wedges. Take your large bowl and place it on the food scale. Make sure your weight is represented in grams. Press tare to show only the weight of what is placed in the bowl. Using a knife/mandolin or food processor shred the cabbage. You can shred it thin or thick. I find it is easier to shred it thin because you can massage it better in the next step. As you are shredding the cabbage place it in the bowl to weigh. Stop when you reach a weight of 900 grams of cabbage. It is important to keep the ratio of salt to weight of cabbage because fermentation is a science. Close the lid of the jar and place it in a cool, dark place. Sometimes I place the fermenting jars in the basement and other times in a kitchen cupboard. Check on the sauerkraut every day. Open the lid, look for tiny bubbles, smell it, taste it. As it ferments the taste will change. Use a fork to push the sauerkraut back into the liquid. It takes it 4 days to ferment. Once the sauerkraut has fermented you can store it in your fridge. Recipe from the book, Real Food Fermentation by Alex Lewin.